We have an uneven floor that when we first moved in tried to repair but were unsuccessful. The root of the problem is a foundation slab which is uneven. We could not even it because there is an unevenness between two walls and did not want to try to mess with slab under the walls. So we actually took out the concrete and repoured the concrete but it ends up basicly the same (sheesh!!!!!). We were in a rush to move in (new baby) and so we laid down hardwood floors onto the uneven concrete slab but the result is worse because when u walk on it u really notice this sudden dip. WHen you are walking down the hall there is this sudden dip which comes on over the course of 2-3" as you walk. 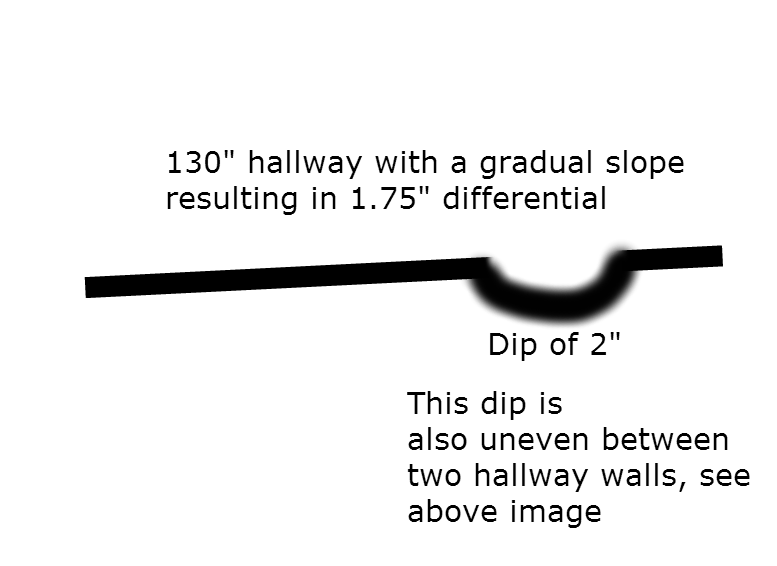 The dip is about 2" deep as you walk forward in the hall, but also 2" between the two walls. So you are dipping on two axis. TO make matters worse, the entire hallway has a gradual decline as it goes to a bedroom. The gradual decline is not the biggest deal to me, but the sudden dip is really killing this new house for me. Any ideas on a good way to go about repairing this. The one contractor I showed this too really rolled his eyes and swayed his head as if to say "this will cost $10million to fix". My basic not saavy at all inclination is to rip out the hardwood floors, install some kind of plywood underneath to make some kind of straight level betwwen the two walls and have the plywood gradually go down until it reaches the level of the room at the end of the hall. Then install hardwood ontop of this plywood. Of course how do you even out the plywood. I guess lots of sanding until its even. I have no idea. Thanks for any suggestions!! Sorry to hear your problem. I just redid my kitch and had an uneven floor. To solve the problem I called my brother who works on the installation of hospital equipment. Those floors need to be precise and he has work with some very uneven floors. I can describe the process. You need to etch your subfloor concrete then find the best self-leveling thin set. Usually not recommended for larger than 1 inch gaps. So Damon is right to do a bulk fill in some areas. Make sure to make the thin set as thin as possible. Use the max amount of water the bag says, no less. I learned the hard way a little thinner is better when leveling. After it dries you will have a level floor. Unless your concrete continues to settle. No surface treatments you attempt will provide a lasting solution if the problem is related to expansive soil on a foundation not properly designed. Unfortunately, by your description of the problem, this seems to be a likely cause. You should inquire with neighbors to see if they have had similar problems and with area real estate agents to find out if your area has history of this. If you recently bought the home, the seller probably had a legal duty to inform you of this. You should call a foundation remediation specialist to assess the issue and provide a cost estimate for repair (these repairs, while not impossible, are expensive and intrusive). Investigate your legal options for recompense through the seller or through your home insurance provider. You can use a very dry mix of non-shrink grout to bulk fill the floor. Set some lines, marks, and straight edges to guide the fill. Then finish off with a cementitious underlayment to get a smooth even top, possibly self leveling although not necessary. If you didn't do the floor then shame-shame-shame on the installers for not fixing this. Take up the floor, dismantle it & number each piece (written on bottom or tape on top), don't cut it. As, I'm presuming & hoping for your sake that it's a click-lock floating floor. Then, go get a few boxes of Concrete Resurfacer. Pour 1/4" at a time & the last coat or 2 can be soupy & thereby self-leveling with a little persuasion. Otherwise, fill it in with cement in one or 2 shots. You'll want to remove baseboards & possibly doors or whatever's affected. But, get it right once & for all. It's concrete there's no reason that you can't get it perfect by topical application. Not the answer you're looking for? Browse other questions tagged flooring floor or ask your own question. 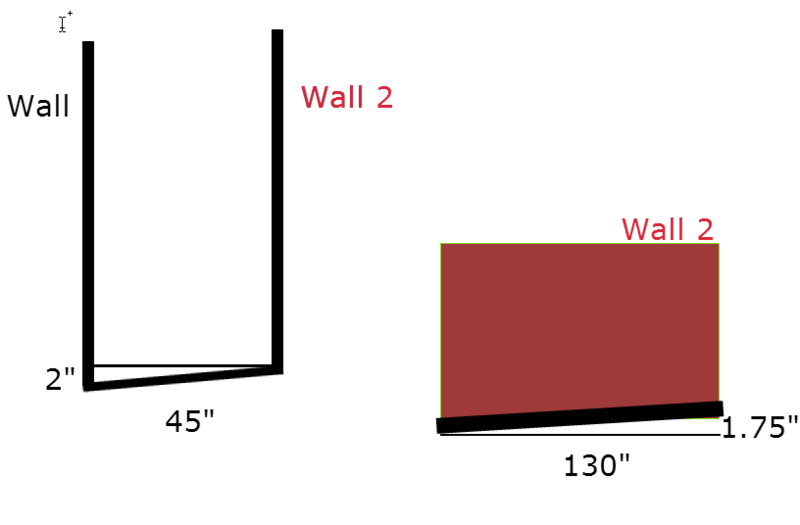 How do I flatten my uneven concrete floor? Suddenly spongy/creaky floorboard patch. What's going on?